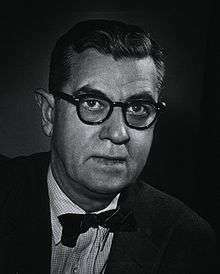 James A. Shannon (9 August 1904 – 20 May 1994) was an American nephrologist who served as director of National Institutes of Health (NIH) from 1955-1968. In 1962 he was awarded the Public Welfare Medal from the National Academy of Sciences. A collection of his papers is held at the National Library of Medicine in Bethesda, Maryland. ↑ Kennedy, Thomas. "JAMES AUGUSTINE SHANNON" (PDF). Retrieved 2 September 2015. ↑ "Public Welfare Award". National Academy of Sciences. Retrieved 17 February 2011.